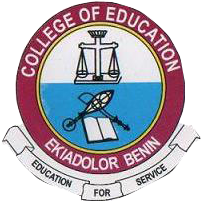 The list of courses offered by College Of Education, Ekiadolor are displayed on this page. Candidates who wish to apply through JAMB should click on any of the courses to see the course requirements. College of Education, Ekiadolor, Edo State, provides variety of top class courses. The purpose of this college is to bring the best of current educational practices to Nigeria. At present, we are a growing community of about 2000 students, but which is intended to grow quite rapidly. The College Of Education has been constituted to achieve the status of Centre of Excellence in the very near future.